YAY is lovely Jo's Happy Birthday today!!! Jo is one of my senior Passionettes and a very valued member of my team, a very sweet girl with a big heart she is a good friend and I am glad to know her. Making her card was a challenge for me as she is the master of Vintage/Grungy work styles that are new and don't come naturally to me. She loves Kraft (she's the one that keeps me on my toes with her fave colours as she's forever changing them) so that's what I went with when I designed her card. I have attempted a layered look again, and while I think is got that look of newbie at work as supposed to effortlessly put together, I am warming towards this style. I find it challenging and I think that the more I do it the better I will hopefully get. In theory anyway.. I started with a Kraft card blank and stamped the En Francaise background all over in Versamark, I then layered the Medallion background on opposite corners this time I inkded in Creamy Caramel ( I have only inked parts of this stamp for an extra distressed look) and finally I topped the background with the swirly stamp from the Whimsical words Level 2 hostess stamp inked in Chocolate Chip. My focal image was inked using markers and I have combined Taken With Teal, Green Galore and Chocolate Chip. The mated circle was then splattered this was great fun and I might show you how I did it in a future video, Shelli Gardner showed this at one of our early training Events so much fun!!! It's gorgeous Mon, very different but beautiful as always. She will love it! Well its a stunner for sure!! 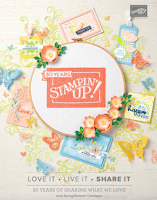 Love all the layering on this card Monica, I wish I had the talent to do it, sadly not....lol I'm sure Jo will love it! Oooh I love this card. The colours really go together. I wish that bird image was for sale, I love it! I so like this vintage look. Cute pin at that! Hi Monica ... I can't believe it! After visiting your blog on numerous occasions, at last I've met you at the Stampin' Up training event in Sheffield today. What a talented girl you are ... and such inspirational ideas on your blog. Also, thanks for all the wonderful workshop tips in your excellent presentation ... it's inspired me to get ringing my friends to organise my first workshop!?! Beautiful card Monica! I love this style and you make it look so easy!! 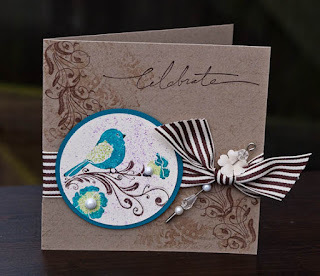 What a gorgeous card, I love that style and I ADORE that ribbon! Was fabulous to meet you at the SU Event in Sheffield! Your Demo was super and pure perfection!